* Flash Web Calendar viewable in most browsers, including MSIE, FireFox, etc. * Different icons can be used for event types, support custom icon images. * Editable title, subtitle, and copyright text line. * Use Monday or Sunday as the first entry of week rows. Eventy is an easy online scheduler for use in company or personal websites. Qweas is providing links to A4Desk Flash Event Calendar 2.20 as a courtesy, and makes no representations regarding A4Desk Flash Event Calendar or any other applications or any information related thereto. Any questions, complaints or claims regarding this application A4Desk Flash Event Calendar 2.20 must be directed to the appropriate software vendor. 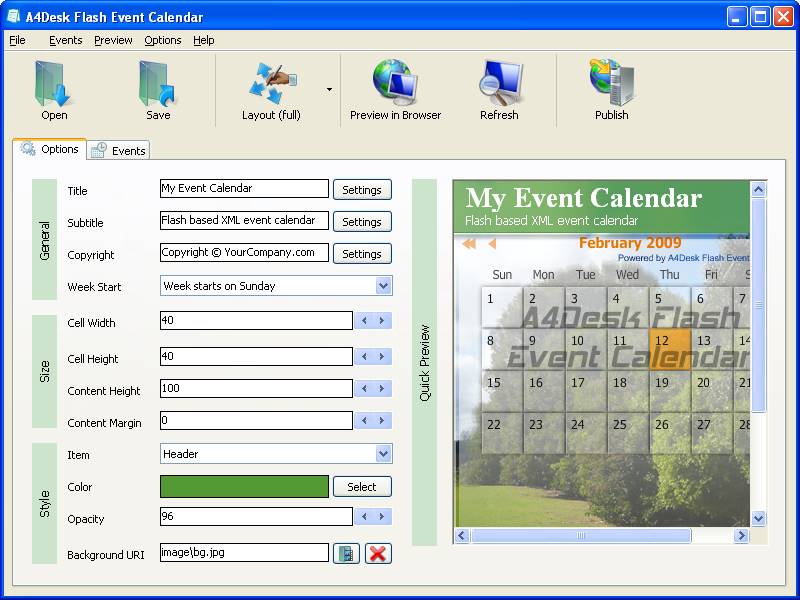 You may click the publisher link of A4Desk Flash Event Calendar on the top of this page to get more details about the vendor.